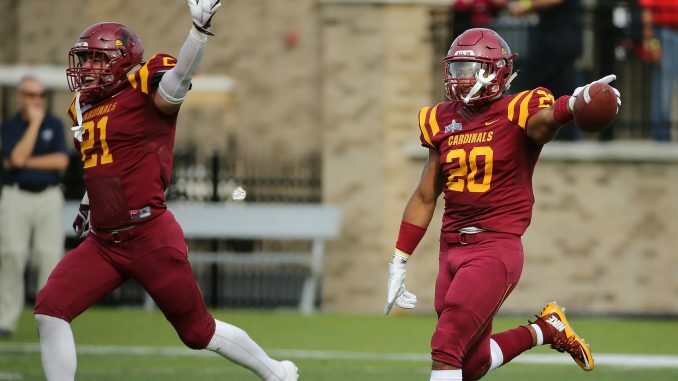 The St. John Fisher College football team sparked a late-game run to defeat Buffalo State 31-28 on a last-second field goal Nov. 10. It was senior night for the Cardinals as the seniors were playing one last time on the turf at Growney Stadium. It was all Buffalo State in the first quarter as they got on the scoreboard first with a forced fumble that resulted in a touchdown. Fisher’s offense was stagnant in the first two quarters as the Cards couldn’t keep possession of the ball. Buffalo State would score again with just over four minutes remaining in the first half to push the lead 14-0. Fisher quarterback Joshua Michels had a little over three minutes left in the second quarter to try and get the ball moving for the Cardinals. With 18 seconds left on the clock, Michels threw a quick slant to receiver Cam Cleveland for a three yard touchdown. Joe Dotterweich brought the Cardinals within seven, 14-7 after the extra point kick attempt went through the uprights. Fisher’s defense had eight seconds left to get a stop before halftime, but Buffalo State returned a kickoff 85 yards to score with time expiring. Fisher went to the locker room down 21-7. Fisher came out of halftime with its defensive team trying to get some stops. They forced Buffalo State to a quick three and out, but once again Fisher couldn’t get it done on the offensive end. Six minutes into the third, Buffalo State scored again to get a comfortable lead, 28-7 with 24 minutes to play in the game. The Cardinals’ offense finally got it going at the six minute mark of the third quarter as Malachi Duvall had a solid 23 yard run for the touchdown. Dotterweich kicked the ball through the uprights again to cut the lead to 28-14 to close out the third quarter. The fourth quarter was all Fisher. The Cardinals got stops at the defensive end and got the ball moving on offensive side. After an 85-yard touchdown reception from Cleveland to cut Buffalo State’s lead only to seven, Justin Wheeler recovered a fumble and returned it 21 yards to tie the game at 28-28. Both teams battled on the defensive end the next eight minutes of regulation. Fisher would have one more series of offense with under a minute of play. Starting from his own 4-yard-line, Michels would complete nine out of 10 passes to bring the ball all the way to the Buff State 24 yard line. With a few seconds left on the game clock, Dotterweich’s 34 yard field goal sealed the comeback win, 31-28. After the win, senior Demarre Nelson and Josh Michels couldn’t hold in their emotions. “This is my last game ever on this field playing for this program and with a comeback win like this, this is something I’ll remember for the rest of my life,” stated Nelson. “With a group of guys like this to start the season with a losing record and overcome such adversity, we were destined to win this game,” Michels went on to say. With the win, Fisher closed out the season with a two game winning streak to go 3-6 overall. Buffalo State dropped to 1-9.